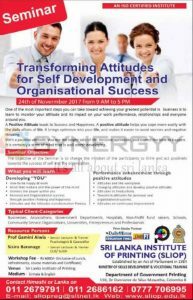 “License to sell” is a unique programme designed by Sri Lanka Institute of Marketing to elevate the standard of Executives, Distributors, Sales Representatives, any individuals who like to start a career in sales and anyone who likes to develop their skills in sales. “License to Sell” contains 11 modules. Each module works independently from the other in order to make it easy for the student to join. 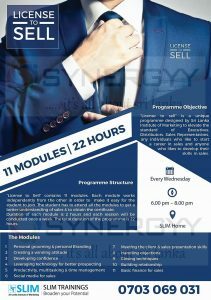 The student has to attend all the modules to get a better understanding of sales & to obtain the certificate. Duration of each module is 2 hours and each session will be conducted once a week. The total duration of the programme is 22 hours. 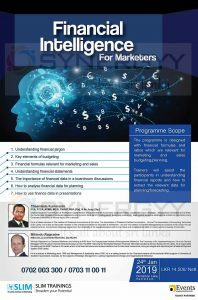 SLIM Trainings organise a programme with a scope of educating marketers about the Financial needs and this programme designed with financial formulas and ratios which are relevant for marketing and sales budgeting/planning. Trainers will assist the participants in understanding financial reports and how to extract the relevant data for planning/forecasting. 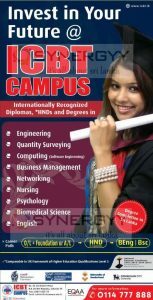 Open University of Sri Lanka is one of the best way to obtain your Diplomas and Degree programme if you don’t have any basic qualifications to enter State universities. And Open University of Sri Lanka Diplomas and Degree programme are high recognised by those who were into the business for so long and know the education system of Sri Lanka. Many of the company appreciate to have Open University of Sri Lanka students as they did their degree programme while they working committed and finish it on time. Therefore if anyone wanted to degree programme at an affordable price, this is the one of the options. 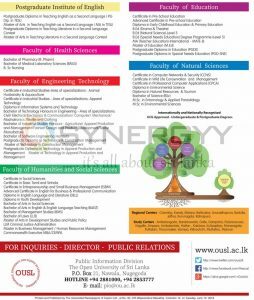 See below details of the diploma and degree programme offered by Open University of Sri Lanka. ICBT Campus invites applications for the Diplomas, HNDs and Degrees for the Year 2018 on following programme. 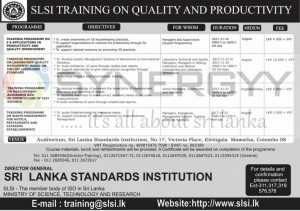 Sri Lanka Standard Institution (SLSI) used to conduct range of training programme in related to standards follow by SLSI. One of the most important steps you can take toward achieving your greatest potential in business is to learn to monitor your attitude and its impact on your work performance, relationships and everyone around you. A Positive Attitude leads to Success and Happiness. A positive attitude helps you cope more easily with the daily affairs of life. It brings optimism into your life, and makes it easier to avoid worries and negative thinking. With a positive attitude, you see the bright side of life, become optimistic, and expect the best to happen IT is certainly a state of mind that is well worth developing. Get savvy with creative thinking the modern skill that future employers will love. Sign up for the best early introduction to unique thinking patterns taught through graphic and animation, Interior design and basic fashion studies, taught by international design experts. Focused on graphic design, motion graphics & animation, interior design and basic fashion designed. 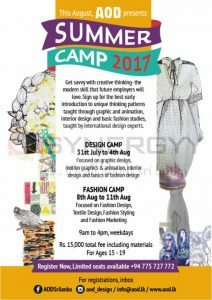 Focused on fashion design, textile design, fashion styling and fashion marketing. 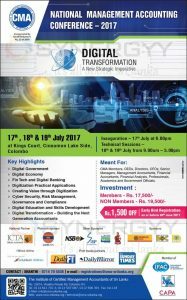 The Institute of Certified Management Accountant of Sri Lanka organise a National Management Accounting Conference-2017 from 17th to 19th July 2017 at Kings Court, Cinnamon Lake Side. National Management Accounting Conference-2017 will be Inaugurate on – 17th July at 6.00pm and Technical Sessions will start from 18th & 19th July from 9.00am – 5.00pm. CMA Members, CEOs, Directors, CFOs, Senior Managers, Management Accountants, Financial Accountants, Financial Analysts, Professionals, Academics and Government Officials. 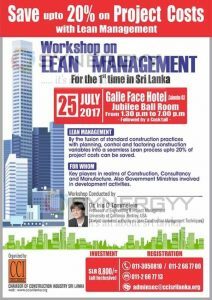 Chamber of Construction Industry Sri Lanka organise a workshop on lean management relates to construction for the 1st time in Sri Lanka. By the fusion of standard construction practices with planning, control and factoring construction variables into a seamless Lean process upto 20% of project costs can be saved. This workshop would suits to Key players in realms of Construction, Consultancy and Manufacture. Also Government Ministries involved in development activities. Venue: Jubilee Ball Room, Galle Face Hotel. 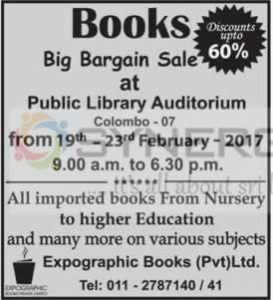 Expographic Books (Pvt) Ltd announces a Big Bargain Books Sale at Public Library Auditorium Colombo – 07 from 19th to 23rd February 2017 from 9.00 a.m. to 6.30 p.m.
All imported books From Nursery to higher Education and many more on various subjects with discounts upto 60%. This painting and visual art competition brings together artists across the country, ranging from school children, university students, amateur and professional artists. Theme: The pulse of the National Airline, carrying the Nation’s pride higher in the sky. The winners of each category will be selected by an independent panel of judges and will be awarded valuable prizes and air tickets. 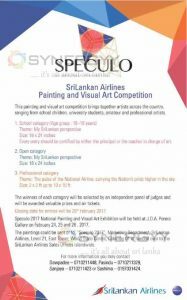 Speculo 2017 National Painting and Visual Art Exhibition will be held at J D A. Perera Gallery on February 24,25 and 26, 2017. The paintings could be sent or to, “Speculo 2017″, Marketing Department, SriLankan Airlines, Level 21, East Tower, World Trade Centre, Colombo 01 or handed over to the SriLankan Airlines Sales Offices islandwide. 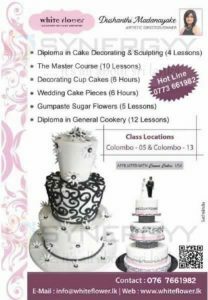 Dushanthi Madanayake a leading cake maker and artistic director of white flower offer range of certificate and diploma courses in cake making. Insurance Association of Sri Lanka organize a 12th International Microinsurance Conference on 15th to 17th November 2016 at Cinnamon Grand Hotel. 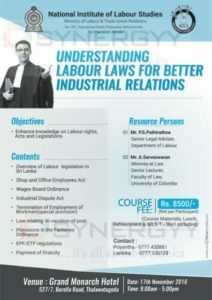 National Institute of Labour Studies, under Ministry of Labour & Trade Union Relations organize a one day workshop on Understanding Labour Laws for Better Industrial Relations on 17th November 2016 from 9.00 Am to 5.00 Pm. 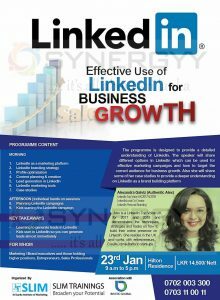 Venue: Grand Monarch Hotel, 527/7, Borella Road, Thalawatugoda. 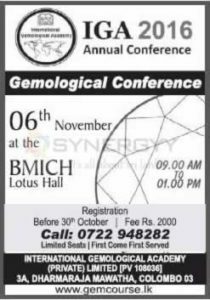 International Gemological Academy of Sri Lanka organized IGA 2016 Conference on 6th November 2016 at BMICH from 9 Am to 1 Pm. 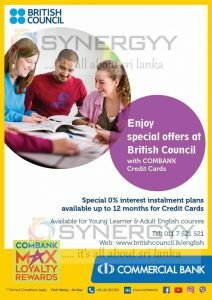 ICBT Campus is private Institute offer foreign university degree programmes which approved by university grand commission in Sri Lanka. 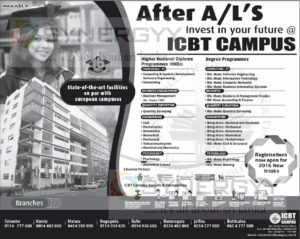 ICBT spread their institutions from Colombo to Kandy, Matara, Nugegoda, Galle, Kurunegala, Jaffna and Batticaloa and offer below HNDs and Degree programme. Sri Lanka’s economic growth potential is not unknown. Its strategic geographical location, proximity and access to growing markets in Asia, high basic development indicators, and human and environmental assets, put it on a strong footing to be a star performer in Asia. Yet, the ability to transform this clear potential into strong performance seems to be elusive. What is required now is to move from issues to solutions, from potential to performance, and from rhetoric to action. 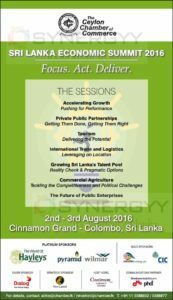 The focus of this year’s Sri Lanka Economic Summit is precisely that; transforming Sri Lanka’s potential with action. This year’s Summit brings together a unique mix of those who know it and those who have done it. Speakers include top names from across the world who, through focussed action and high performance, have made progress and made a change. Sessions are structured to ensure that participants understand the issues, but are swiftly moved on to discussing possible solutions and feasible action. 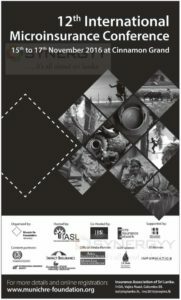 Speakers will highlight good practices from other contexts and distill lessons for Sri Lanka’s own economic transformation. The Session on Private-Public Partnerships will discuss specific actions that need to be taken to mobilise private investment to meet public policy challenges, including good practices in devising PPPs that balance investor and government interests. close look at practical options for Sri Lanka to meet emerging skill needs through liberalizing inward migration for certain sectors, attracting back skilled workers in the diaspora, and improving the climate for young people to thrive. In the session on Tourism, speakers will discuss what it will take to position Sri Lanka strongly in overseas travel markets, attracting investment and quality tourists, and navigate new challenges brought on by the digital economy and informality. The session on international logistics and trade will explore what concrete steps need to be taken to leverage on Sri Lanka’s location, including attracting international players into the country’s logistics industry, modernizing infrastructure with private sector partnerships, and linking into global value chains. In the session on agriculture, speakers will take an incisive look at why existing agricultural and land policies are holding back productivity in the sector, what short and long term options are available to transform plantations given the political economy sensitivities, and how to boost agribusinesses. With the state-owned enterprise sector still playing a dominant role in the economy and the public sector expected to deliver on economic transformation, the final session will explore what reforms are needed in the public sector to enable faster growth.